so, i’ve been working on some sewing projects lately. just a simple half-curtain, nothing too exciting. the fabric is by anna maria horner. 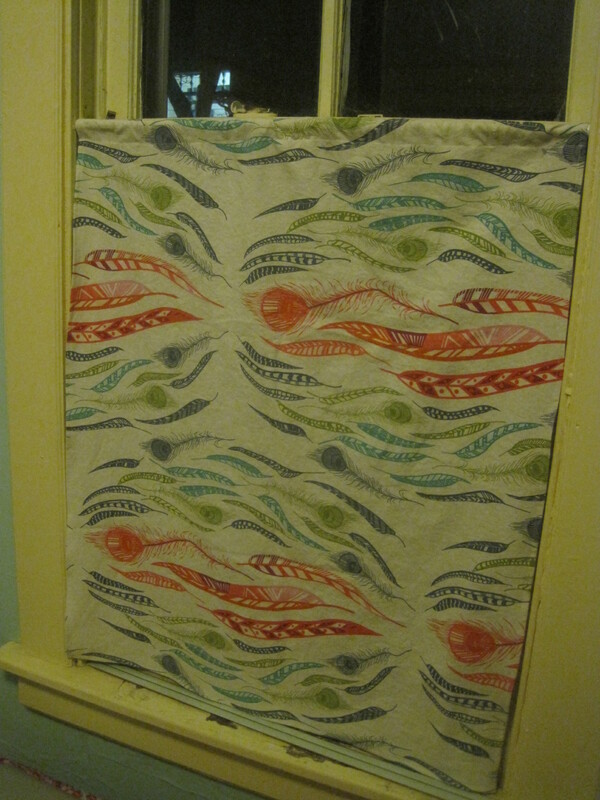 she also designed the fabric i used to make the half-curtain in the kitchen, the curtain in the bathroom, & the slipcover for the bench under this window. her designs tend to be a bit loud for quilts (in my opinion), but i like them for home decor. this is a skirt i made for myself. clearly it could stand to be ironed again, but…whatever. this is the same fabric as i used for the curtain, just in a darker colorway, & turned so the feathers are on the vertical (more flattering for clothes). there are slits on either side of the feather print layer. i made this from an alexander henry fabric called cartas marcadas. it comes in a few different colorways. obviously i chose the brightest, most colorful one. i bought this several months ago, & it wasn’t until i got it out to make the skirt that i was like, “…is this culturally appropriative?” i asked facebook & a few people were like, “yeah, sorry.” a few other people just made fun of me for asking. apparently they found the idea of fabric being racist quite comical. i still don’t totally know how i feel about it. i’m reminded of like 2000, when queen bee had that line of trucker bags with a loteria card sewn into a clear vinyl pocket on the front. they were really cool-looking, & i bought one (as did everyone else i know), but i worried so much that the bag was culturally appropriative that i never used it & ended up giving it away. i’m also reminded of a baby carrier i have (that i don’t use; ramona is too big for it now) printed with glittery sugar skulls. it’s really cool-looking…but culturally appropriative? 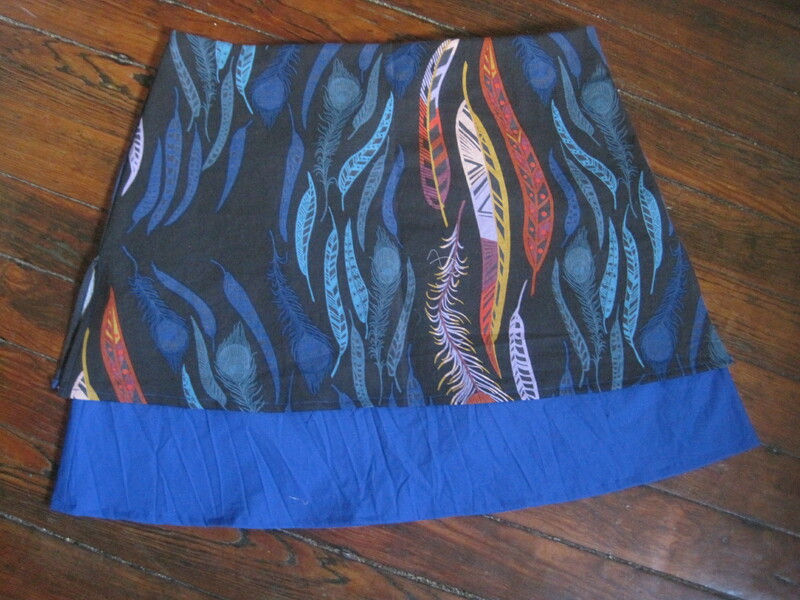 when i first saw the fabric, i just liked it, i thought i could make a cool skirt with it, & i bought it. i don’t know. i scoured the internet in search on some other socially conscious sewing person who might have thoughts on this topic, but i didn’t find anything. anyway, the skirt is made now. it’s pleated. four pleats in the front, two in the back. despite all the time i put into ironing them, they don’t really lay flat when i am wearing the skirt. which made me wonder…am i too chubby to wear pleats? should i sew thm further down so they fall open over my legs instead of my abdomen? not sure. maybe it’s just a fabric weight issue. had i used something heavier, like a wool blend, maybe they’d fall more nicely. but this is just basic quilting cotton. & i taught myself how to do turned edge applique. it was…really easy. like, so easy, i wondered if i was doing something wrong. i don’t really understand why anyone does raw edge applique when turned edge is so easy (unless they just prefer the raw edge aesthetic). this was my experiment, which i turned into a patch for my hoodie. i think i’m going to be appliqueing A LOT of stuff in the future. i already have plans for a skirt, & a quilt, & a set of napkins, & who knows what else. it’s tricky to find time to sew now that ramona is older. if she gives me a two-hour nap, that’s a major victory. & if she’s awake & i’m sewing, she wants to be right there, usually at my feet trying to pick up my machine pedal so she can repeatedly slam it into the ground until it breaks. it’s also difficult to find time for sewing & everything else i have to or want to do: write, read, go to the pool, take care of ramona, socialize…but i guess that’s just hard with a baby no matter what. the trick is that i tend to get really absorbed when i sew. hours can go by before i realize that i’ve been hunched over my sewing machine & my hands are gnarled claws from manipulating pins & tiny scraps of fabric. i don’t really get sucked into reading or writing the same way. anyway, ramona is awake now & trying to eat little pieces of fuzz off the floor & then being outraged when i take them away. so i guess i should get back to momming. 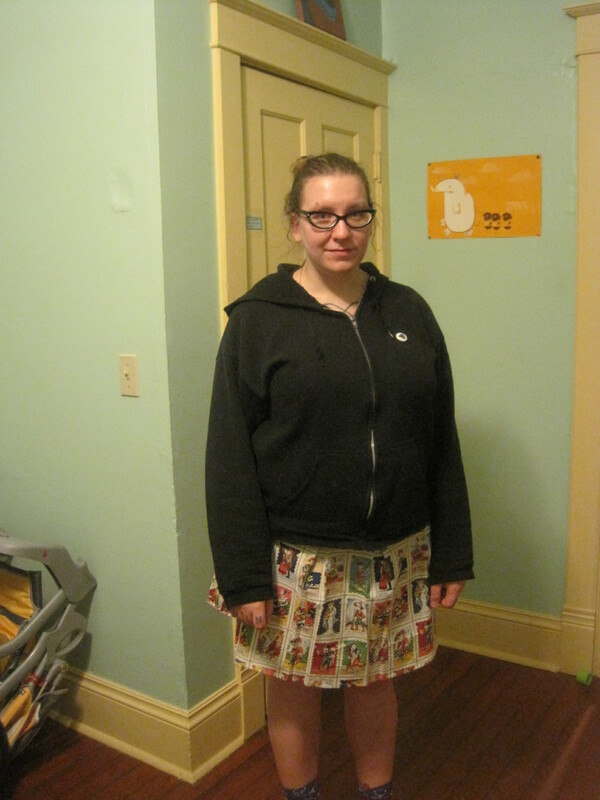 Previous Post2013: the year in reviewNext Postfeminist skirt! That feather fabric is great! I use fuse n’ bond for all of my applique. I usually go for the medium weight one, which technically doesn’t need to be sewed down. But then I’ll hand sew it down using a blanket stitch because a) I don’t trust them and 2) I find hand sewing very soothing. It also gives me something to do with my hands when I’m stuck on conference calls! I wish I had more applique projects to work on. I don’t usually have time to sit down in front of a sewing machine, but I often have an idle few minutes where I could hand stitch for a bit. i used a lightweight fusible. 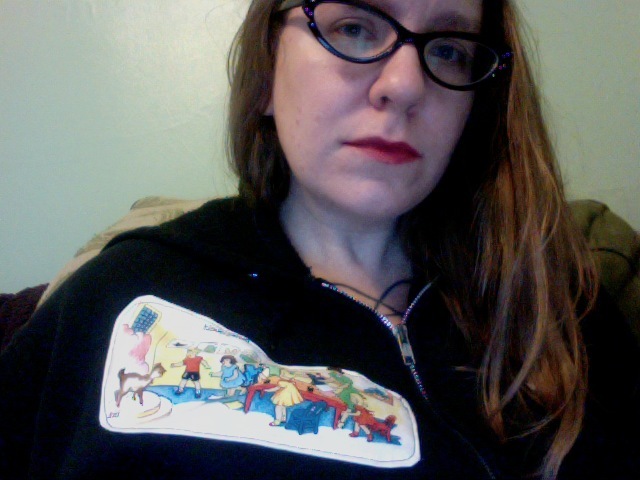 i machine-stitched it to the hoodie because i am not a big fan of hand-stitching. i get my fill of hand-stitching doing quilt bindings. plus i like to practice machine-sewing curves, & i like the way it makes the applique look outlined.